It's all about how you feel when you walk in the door. Does your home make you happy? Is it a calm retreat from the chaos and over stimulation of the outside world? Do you constantly feel overwhelmed by projects that you just can't quite complete? Are you tired and drained and not sure why? We all want a nurturing home that offers a refuge. Not one that leaves you frustrated and exhausted. Relaxing and pretty. Suzanne Kasler curated softly colored abstract art that pairs with her signature fabrics and finishes for Ballard Designs. Photo: Ballard Designs. As a Southwest Florida interior decorator, I have my clients fill out a brief questionnaire before I meet with them. The first question: "How do you want your home to feel when you walk in the door?" Tell me how you want your home to feel and I will make everything else fall into place. Each answer is the same. Everyone wants a "calm" home. Of course we do. It's not about "stuff." You may have everything that you could dream of in your home and it still doesn't feel right. Check out these tips that I use for my clients and see how it changes your space. We talk about this a lot in design and decorating but if you don’t do anything else, do this one. It costs nothing. And it has the most impact. Do it today! Delete some of the visual stimulation. Pare down your accessories. Eliminate or rearrange some furniture and establish a comfortable conversation area that is relaxing. And your closet. Most of us wear 10% of what is in our closets. So why not just have the 10% in your closet? Instead of the piles of clothes that you never wear any more. It’s all visual clutter and it’s exhausting to look at and to think about. But sometimes the thought of decluttering itself is overwhelming. Just the physical aspect of getting rid of things and deciding what to do with them is difficult and stops homeowners in their tracks. Because it requires sorting it into what gets donated, given away and tossed. The solution: leave that part for another day. Remove it all from your house. Stash it in the garage until you have time to make the decisions. Meanwhile, you will love your decluttered home so much that you won’t mind saying goodbye to the clutter when the day comes. The eyes need a place to rest. Don't cover every surface and every wall. Don't be afraid of space. It is what most of our homes are lacking and it's the very thingthat creates a calm home. Create a space to end your day with comfortable linens and fresh colors. Photo: Pottery Barn. Comfortable pillows. Nice sheets and comforter. A window treatment that blocks out the light. Pretty, restful artwork and accessories that make you feel good. We all spend a lot of time in this room and it's not the place to cut corners. Rethink your color palette and drop it down a notch. 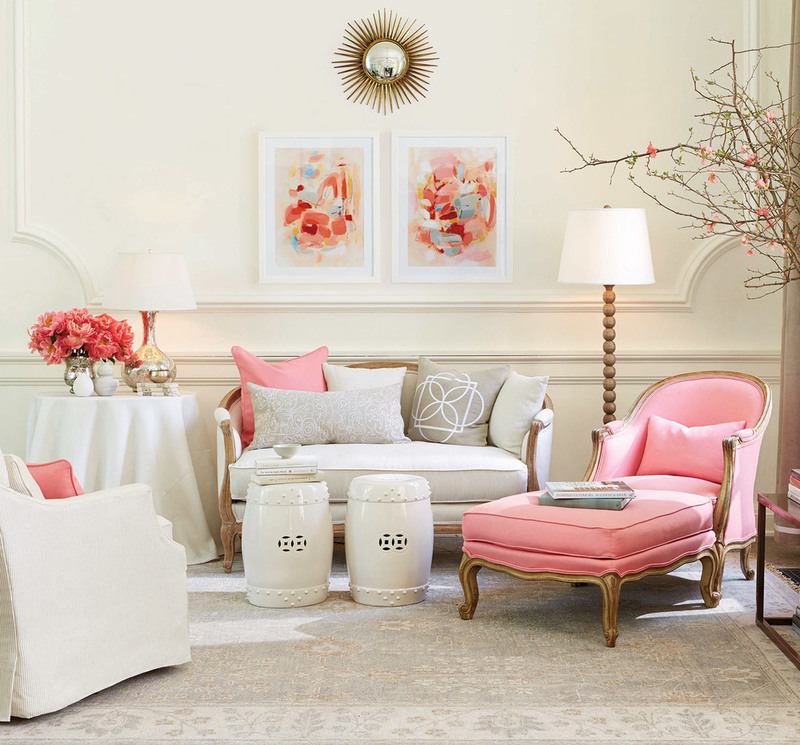 Soothing colors and more muted fabrics equal a calmer home. Save the bold colors for your family room and outdoor spaces. Of course this does not mean that a well-place splash of color against the most toned down backdrop is not gorgeous! Design a spa bathroom for relaxation. This is a service that I have done for my clients since I have been decorating homes. And it’s really easy. You can do it today. Think about what you love at a luxurious hotel or spa. Lots of white. Clean and crisp. Fluffy towels. Thick rugs. Plants. Candles. Soaps and aromatherapy. And don’t forget a spa robe. White is the key here and it must be done in a spotlessly clean bathroom. This should be your calming retreat at the end of the day. For a spa look, try this Morgan shower curtain of soft cotton with a band of color, along with organic cotton towels. Photo: Pottery Barn. Forget the harsh, overhead lighting and install dimmers on all lighting. We all have them. Something that you carry around from home to home. You don’t like it but you don’t feel like you can get rid of it. Give yourself permission. Keep what makes you happy and anything with a negative or tiring association, send it out into the world where someone else will find it useful. It may be art, a photo or a piece of furniture that no longer serves you. Remember: it’s your home and you are not obligated to keep anything. Create a space for solitude. Give yourself permission to have a nook or part of a room where you can relax. Just you. Maybe it’s space for a yoga mat or a lounge chair where you can read. Create a corner in your home where there are no electronics or noises. A place where you can think and start to wind down from the day.